Spoons Riverside is a cafe, restaurant, wedding and function venue uniquely located on the Little Murray River in Swan Hill, Victoria. Spoons is open for breakfast and lunch 7 days per week, and is open for dinner Thursday, Friday and Saturday nights. 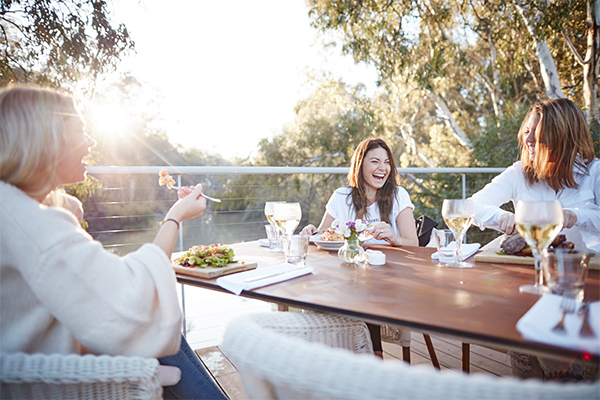 Spoons is located riverfront with views of the Little Murray River from the outside deck area providing spectacular views as Swan Hill’s only riverfront restaurant. Along with a gift shop and provedore full of unique and local produce and gifts. Spoons hosts a wide range of functions from birthdays, engagements, work functions and weddings including both ceremony and reception. Located in one of Australia’s premier food growing regions, in the heart of the Murray, Spoons pride themselves on fresh seasonal and regional produce. Spoons creates seasonal menus sourcing from local suppliers where possible to support local businesses and farmers, along with ensuring freshness. Located just over 1km from the centre of town, Spoons is right next door to the Pioneer Settlement and the Swan Hill Regional Art Gallery. Locals and tourists alike enjoy Spoons for the ambiance, quality service and unique dining experience. Spoons Riverside is operated by Murray Downs Golf and Country Club Limited which operate 3 businesses in Swan Hill; Murray Downs Golf & Country Club, Swan Hill Club and Spoons Riverside. Spoons Riverside and Swan Hill Club operate in Victoria, whilst Murray Downs Golf and Country Club operates over the bridge in NSW at Murray Downs.